The Wayne State University School of Medicine hosted the 20th annual Graduate Student Research Day on Oct. 7 in Scott Hall and the Margherio Family Conference Center. 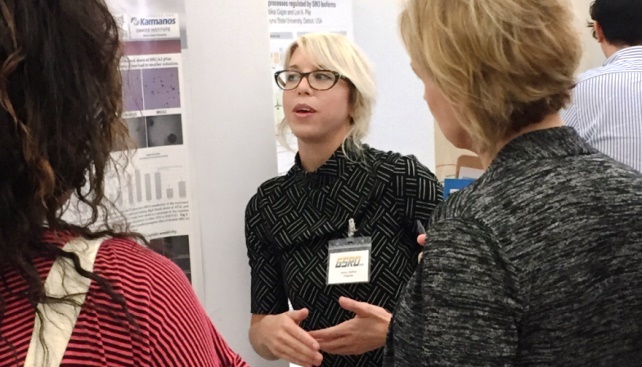 The student-run event highlighted nearly 100 biomedical science oral and poster presentations given by doctoral students, medical students and master's students within the School of Medicine and several other WSU schools and colleges. "Indeed, this is the premiere event for our graduate students and this is reflected in the level of participation by not only graduate and medical students from the School of Medicine but this year with students from the colleges of Pharmacy, Engineering, Nursing, and Liberal Arts and Sciences," said Daniel Walz, Ph.D., associate dean of Research and Graduate Programs and a professor of Physiology. "The quality of the science is outstanding, as is the professionalism of the presentations. This is a tribute to each presenter as well as to their respective mentors." The event was dedicated to Chuan-Pu "C.P." Lee, Ph.D., who died July 20. Dr. Lee retired in 2011 after 36 years with the School of Medicine, then served as an advisor for the Department of Biochemistry and Molecular Biology. She was a strong advocate for WSU graduate students, offering pre- and post-doctoral travel awards to help offset the cost of national and international conferences. Dr. Lee also worked with the GSRD planning committee to establish a cash prize endowment for first, second and honorable mention presentations each year. Her life and memory will continue to serve graduate students through the newly titled event, The C.P. Lee Graduate Student Research Day. The event's 2016 organization committee included students Nicholas Spellmon, Jaime Stafford, Molly Estill, Sarah Dubaisi, Anthony Anzell, Joanna Miller, Jordan Zhou, Andrew Jerome, William Close, Chandni Patel, Tyler Peters, Ruta Jog, Shengjie Cui, Fatme Hachem, Leena Kadam and Andrew Kulek. The day included three oral presentation sessions and two poster presentation sessions, followed by an afternoon keynote address from Andrew Fire, Ph.D., a Nobel Prize winner and Stanford University School of Medicine Distinguished Professor of Pathology and Genetics. Dr. Fire presented "Opportunistic RNAs and Acquisitive Genomes." His research interests include understanding the RNAi machinery, studying mechanisms by which cells adapt to genetic changes and determining factors that trigger cells to respond to foreign material. He received his doctorate in Biology from the Massachusetts Institute of Technology in 1983, and took the 2006 Nobel Prize in Physiology and Medicine with Craig Mello, Ph.D., for their pioneering work in the new field of RNA interference-gene silencing by double-stranded RNA.